LONDON--(BUSINESS WIRE)--The global matcha green tea powder market is expected to post a CAGR of more than 9% during the period 2018-2022, according to the latest market research report by Technavio. A key factor driving the growth of the market is health-promoting benefits of matcha green tea powder. The consumption of matcha green tea powder has been growing at a rapid rate across the globe and one of the major reasons behind this is the increasing awareness among consumers about the health benefits of consuming matcha green tea powder-based products. The consumption of matcha green tea improves the functioning of the endothelial cells and prevents the clogging of arteries. Furthermore, matcha green tea is a concentrated source of polyphenols, antioxidants, and flavonoids, which makes it an ideal medicinal supplement as well. This market research report on the global matcha green tea powder market 2018-2022 also provides an analysis of the most important trends expected to impact the market outlook during the forecast period. Technavio classifies an emerging trend as a major factor that has the potential to significantly impact the market and contribute to its growth or decline. Since 2014, many large vendors of the global coffee market have merged with or acquired several small pure-play and regional vendors of the global matcha green tea powder market to enter the emerging matcha green tea space. Furthermore, many large vendors are expected to acquire small and regional suppliers during the forecast period. For instance, in November 2017, Unilever acquired a leading specialty tea brand named Tazo from Starbucks Corporation through a deal worth USD 384 million. Therefore, such M&A are expected to boost the growth of the overall global market. “Some of the other M&A’s include Unilever’s acquisition of another leading UK-based organic herbal tea manufacturer Pukka Herbs for an undisclosed amount, and ITO EN Company’s acquisition of US-based Distant Lands Coffee,” says a senior analyst at Technavio for research on food. This market research report segments the global matcha green tea powder market by product (classic matcha, ceremonial matcha, and culinary matcha) and geographical regions (APAC, EMEA, and the Americas). The classic matcha segment led the market in 2017 with a market share of more than 58% of the market share, followed by ceremonial matcha and culinary matcha respectively. However, during the forecast period, the culinary matcha segment is expected to register the highest incremental growth followed by the ceremonial matcha segment. 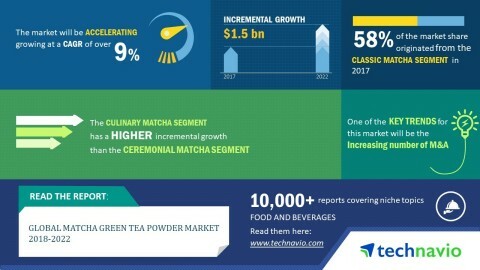 The global matcha green tea powder market is expected to post a CAGR of more than 9% during the period 2018-2022, according to Technavio.